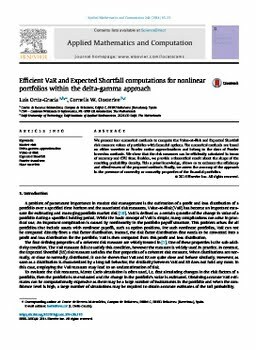 We present four numerical methods to compute the Value-at-Risk and Expected Shortfall risk measure values of portfolios with financial options. The numerical methods are based on either wavelets or Fourier cosine approximations and belong to the class of Fourier inversion methods. We show that the risk measures can be efficiently calculated in terms of accuracy and CPU time. Besides, we provide a theoretical result about the shape of the resulting probability density. This a priori knowledge, allows us to enhance the efficiency and effectiveness of the proposed methods. Finally, we assess the accuracy of the approach in the presence of convexity or concavity properties of the financial portfolios.